We spent the holidays at "home home" in California. It was sunny and gorgeous and warm... and other people cooked the whole time! I made this bread once, and that's it. We ate at some of our fave local spots (not enough though,) we ate some amazing home-cooked meals and the baby ate a lot of beach sand. It was a delicious vacation. Getting home from the airport was overly eventful with a lost cell phone, a parking shuttle chase and a road-raging psycho driver. Needless to say, today was a reset day and we needed a quiet, at home, comforting dinner. 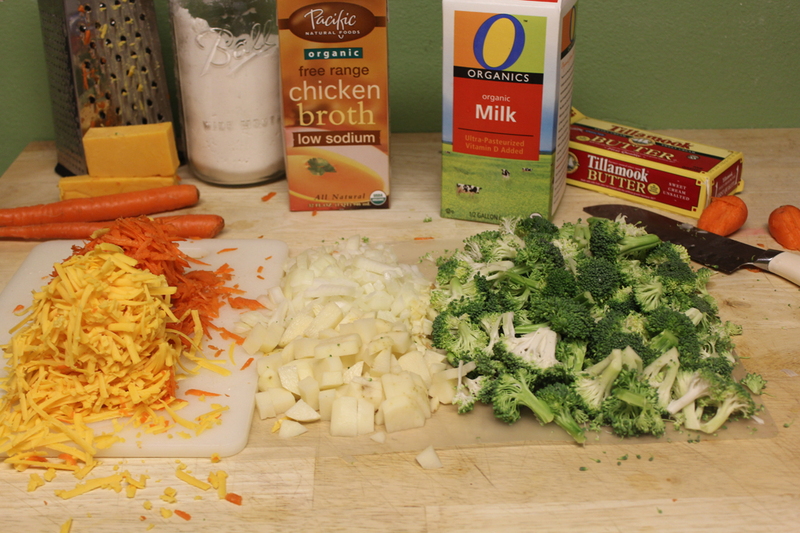 I've made this broccoli cheddar soup a few times now. I use WAY lighter ingredients than a lot of other recipes I've found online, (milk, not cream and less sharp cheese, rather than a lot of milder cheddar) but it's still soup made with cheese, so it's never going to be calorie free... but I don't believe in fat free cheese... I like this in-between version. Broccoli Cheddar Soup - inspired by Panera and lots of Googling. In a large, high sided pan melt 2 tablespoons of butter and add onion, garlic, carrots and potatoes. Cook until onions are becoming translucent and veggies are beginning to soften, about 5 minutes. Add remaining 2 tablespoons of butter and melt onto veggies. Sprinkle in the flour and stir to coat veggies. This will make a sort of roux that will thicken the soup since we are using milk, not heavy cream. Cook for about 2 more minutes. In a small pan, heat the milk and broth until warm - do not boil. Add the warmed milk to the veggies and stir to combine, make sure to scrape the bottom of the pan to incorporate all of the sort-of-roux. Add in the broccoli and gently simmer the soup for about 10 minutes or until the veggies are tender, but keeping their shape and texture. Make sure not to boil - the soup will thicken slowly. Add in the cheese and cook on low for 5 more minutes. The cheese will further thicken the soup. Season with salt and pepper. I've used an immersion blender to partially puree this soup - it's just as good and still looks pretty! Because we are using milk, it's really important not to overheat this soup. It will separate. Just heat gently and slowly. The veggies will cook and soften in no time. Promise. 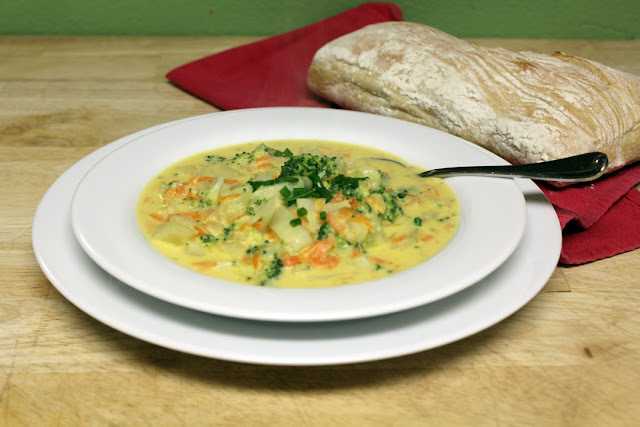 The potatoes are totally optional, but especially good if you use an immersion blender, they really make this soup nice and thick.